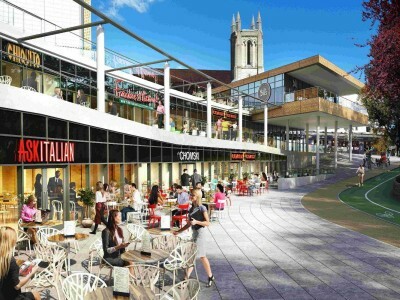 The cycle path around the new Odeon building in Bournemouth gardens is set to be widened, the council have confirmed. Cyclists will have access to a shared, five metre wide space that is adjacent to the ground floor restaurants and public walking area. Developers Licet will be paying for the cycle lane as well as new footpaths and carriageways around the building. The announcement comes after concerns were raised by the Bournemouth Cycling Forum about safety, in what is likely to be a highly congested area. Angela Pooley from the Forum says that the plans will “hopefully work” to keep the area safe. However, some residents have expressed their concerns at the plans. Local mum Jessica, who regularly cycles with her children thinks, “it’s ridiculous to keep a cycle path next to restaurants which will obviously be really busy. It’s going to cause accidents”. Noel Desmond from the council disagrees that the area will be unsafe. He says that safety has been considered and that, “the surface will be different to that of the walking area and there will be new signs and bollards to alert walkers to the cycling path”. The new cinema, which is part of the West Central Leisure Complex, is set to open in early 2017.